On your wedding day, you will surely get excited about informing and inviting your loved ones from the different parts of the world. While that is indeed an exciting opportunity that you will most likely experience once in your entire lifetime, it cannot be denied that no matter how your guests would really love to attend to your special day, they will surely experience fatigue and even jet lag. This is why it is very important that as soon as they arrive at your wedding destination, their presence should be honored and should be given a really warm welcome. Giving them something that is a simple letter can actually make them feel like all the effort of traveling is indeed worth it. 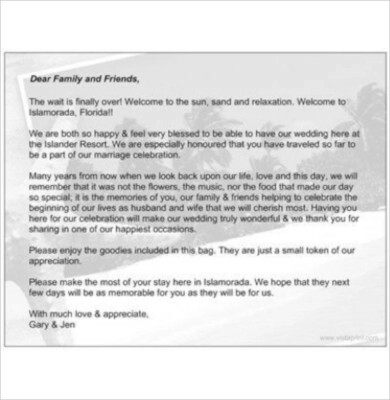 A letter, such as a wedding welcome letter, can indeed make them feel really welcomed. So if you are intent on having your invited guests as witnesses of your special day, you can always create and give them a wedding welcome letter. And since you obviously don’t have any experience in making one, you can make use of the letter examples and templates that are being provided in this article. Aside from handing them with wedding thank-you notes after the wedding (which is also a must), handing them a wedding welcome letter similar to the given example is also one way of showing your sincere gratitude about their attendance to your wedding day. Your guests have come from near and far to celebrate with you on your special day and it’s just right that you will also make them feel special by giving them an equally special wedding welcome letter to express how much you appreciate their presence at your celebration. To make it even more special, you can further personalize your wedding letter by handwriting them all. It will be tiring for sure but it’s worth it if you are doing it for your loved ones! 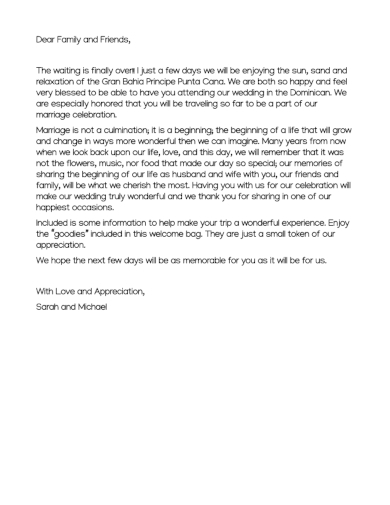 Take a look at this basic wedding welcome letter and get inspired on how you will be able to convey your words of welcome to your guests who are coming all the way from their respective cities and towns especially if you will be having a destination wedding. And just like this example, be sure that the letter that you will be writing is heartfelt and gracious enough so they will indeed feel grateful and not feel any regret at all for coming. Aside from your words of welcome, you can also further personalize your welcome letter by adding a background image, particularly a picture of the venue of your destination wedding, so your guests will get even more excited of what is yet to unfold. Sure, you can always opt printing your wedding welcome letter on a bond paper or a special scented paper, but have you ever considered writing one and making a postcard out of it? Printing it as a postcard is actually just perfect especially if you are going to have a destination wedding since you can always include a picture of where it’s going to be. But aside from that, printing it as a postcard allows you to give them a remembrance of your special day as well as a memorabilia of your wedding’s destination itself. 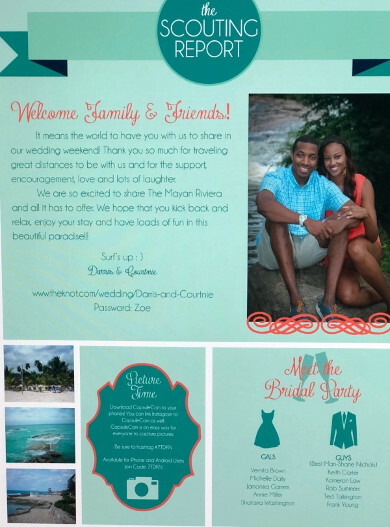 Plus, you can also conveniently place these postcards inside the wedding welcome gifts or wedding welcome bags that you will be handing out to them soon as they arrive at your destination wedding. If you are going to give out wedding welcome letters to your guests, it’s either you go big or go home! And if you will indeed go big, then you make sure that the letters you are going to give out are of the finest quality and aesthetics. Do you want to get inspired on how to make one? 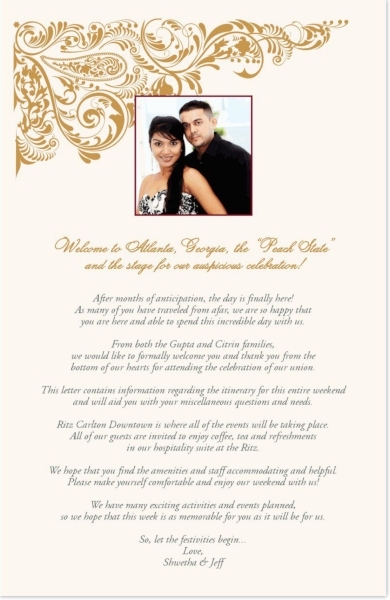 Download this Indian couple wedding welcome letter example and get inspired. It is also advised that you must have already figured out your written content so you can already go straight on to the fun part which is designing the overall look of your welcome letter. Make sure that your design choices will match well to the color theme and style of your welcome gifts or wedding welcome bags, and of course, to the wedding itself. 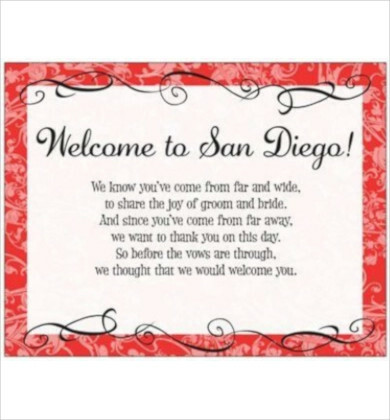 Even if you are only planning to have a simple wedding celebration, this does not mean that you can’t hand out your guests with a wedding welcome letter because you surely can come up with one that is just as similar as the given example above. No matter how simple your letter might get, what really matters most is that these were personalized letters that you were sincere in giving and that you have written an equally sincere and heartfelt letter that will indeed make your guests feel special and valued. Do you know that you can add more items to your wedding welcome letter aside from the letter itself? By dividing the space of where you are going to input your letter into comprehensive sections, you can add a creative twist to your entire letter similar to the given welcome letter example above. You can include the itinerary for the wedding day, images of the places where you are going to tour around especially if it’s a destination wedding, the list of the names of people that comprise the wedding entourage, and more! We hope that this article has been a great source of inspiration to you as you write your own wedding welcome letter. Be sure to download these examples so you will feel inspired whenever you make plans for your big day!